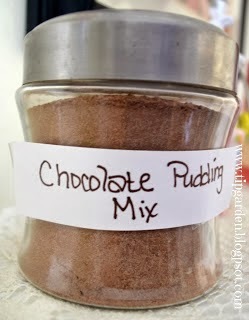 Making your own pudding mix is easy and thrifty! Have you read the ingredients on the back of those little boxes of pudding? Can you even pronounce all the names of the ingredients? Did you know that you already have the ingredients to make your own mix? Save money and control the ingredients? What could be better? This pudding mix is a cook pudding, but only takes a few minutes to prepare, and is warm, creamy and delicious! 1) Sugar free? You can use a sugar substitute as long as it is the kind that measures out the same as sugar. I have no experience with more concentrated kinds in a large recipe like this. Mix all in ingredients together in a large bowl. Pour into a 6 cup container with an air tight lid. Label and date your mix. Use mix within 3-4 months. Makes 6 cups of mix. Now here's how to make that pudding! In a saucepan, combine pudding mix and milk. Cook and stir over med. heat until mixture thickens. Remove from heat and stir in the butter and vanilla. Pour into serving bowls. Mix and store in airtight container. Makes 4 cups.